Visual Patch 2.0 is a fast and efficient solution for software developers wanting to create secure binary difference software patches. Simplify your software version management and turn the otherwise complicated task of managing point releases into a fully automatic solution. There is no better way to make professional-quality, full-history binary patches for software and other electronic content. 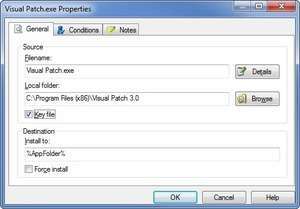 Visual Patch 3.5.1.0 is a shareware program and can be used as a demo to try the software until the free trial period has ended. A full version of the program is available after the trial period ends. For security reasons, you should also check out the Visual Patch download at LO4D.com which includes virus and malware tests. Additional screenshots of this application download may be available, too. Reviews, updates and downloads of programs to zip, rar, ace and decompression formats for Windows and other platforms. Features free freeware downloads and shareware options. Check out some of the freeware downloads available in the file archiver category. They contain no strings and are available at zero cost. Visual Patch download been highly rated by our users.